Team XYZ from General Sir John Kotelawala Defense University (KDU) beat team In Toxic from Informatics Institute of Technology (IIT) to emerge as the champions of Virtusa LAN Challenge 2018. They walked away with the grand prize of Rs.100,000, at the finals held at Virtusa’s Colombo Advanced Technology Centre (ATC) recently. Team MBK from Virtusa were the winners in the Inter Virtusa category. “Part of our student engagement efforts, it gives them the opportunity to compete in a professional gaming environment while offering them a glimpse of our corporate culture and work environment. We firmly believe that initiatives such as this play a significant role in shaping them into exceptional all-round technology professionals,” he added. 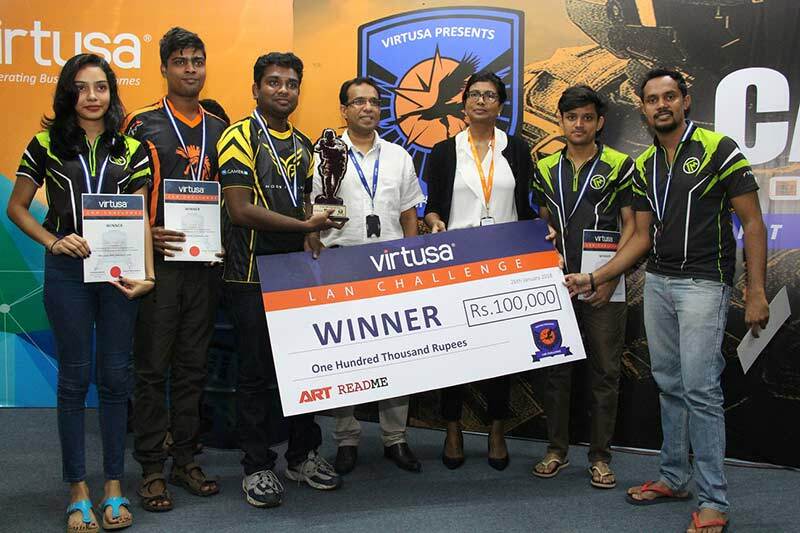 Organized by the Virtusa Game Development Special Interest Group (GDSIG) and the Virtusa Campus Reach Initiative with the support of the company’s technology leadership, the gaming tournament has come a long way from its humble beginnings as a low key internal team building initiative in 2011. This year’s event was kicked off in December 2017. 80 teams participated at the Internal University games while 30 of them were invited to Virtusa to play at the quarter finals at the inter- University games.